In the major world religions based on the holy book called the Bible, there is a common belief that people have only two fates available when they die. Good people, who have followed the rules of their religions, are believed to go to Heaven where all is wonderful forever. Bad people, who did not follow the rules of their religions, will be doomed to go to Hell, where all is very much not wonderful forever. The ruler of Hell has many names ― Satan, Lucifer, Beelzebub, Old Nick ― but is most commonly known as the Devil. 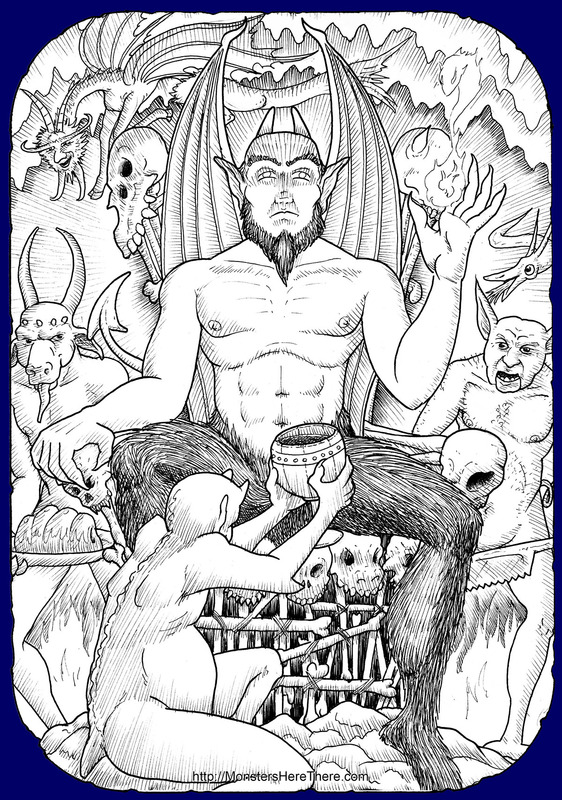 He is usually depicted as basically human, but with red skin, horns, and a pointed tail. More optionally, he has also been depicted as having the legs of a goat with cloven hooves, and wings ― sometimes bat-like, sometimes birdlike. Ruler of all that is evil, the Devil delights in punishing people in his terrible domain. His minions are called “demons”, and they come in all manner of form, size, and color, each more horrifying than the last. It is said that the Devil is not content to rule just Hell; he forever plots to take over Heaven and Earth as well. To further this goal, the Devil tries to trick people who would normally go to Heaven into coming to Hell instead. Usually, the Devil interferes in the lives of those on Earth by sending out his demons to manipulate, trick, and/or control people to cause havoc in the human world. The Devil’s assault on mankind is based upon his belief that, given a chance, most humans will choose to be bad rather than good. Most demons simply make people aware of opportunities to be bad, such as money left unattended on a table, or maybe showing a way to cheat on a test. This is done in the belief that once a human gets started, it becomes easier and easier to convince them to be bad in stronger ways... like robbing or hurting another person. Now you might be worried that demons are trying to make you bad. Well, there’s something you can do about it... don’t be bad. Remember, most demons can tempt you to do bad things, but the final choice is yours; if you don’t choose to be bad, they can’t force the matter. Of course, there are ways to get rid of these demons. For one thing, they don’t like anything that is sacred to Biblical religions, as these represent all things good. So demons generally cannot enter a church, or stand the touch of the holy book called the Bible. Holy water that has been blessed at a church, a cross symbolic of this faith, and prayers to the Biblical God also scare off these evil creatures. The Devil and his demons are also said to be afraid of salt, because it is considered a purifying agent, and a symbol of both immortality and goodness in many cultures. When salt is spilled, it is said to be an omen of bad luck; so it is traditional in Europe and the United States to take a pinch of the spilled salt and throw it over the left shoulder... and presumably into the face of the demon who made you spill it! Sometimes the Devil or his demons enter a human’s body and take control of it, a phenomena known as “demonic possession.” Usually, the victim has a personal weakness that allows the demon to enter them to start with. Once there, the demon can more directly infl uence the person’s actions and decisions, quickly changing their approach to the world to something mean and evil. The fl aw to such a direct effect, of course, is that the person’s obvious change of behavior will alert many people to the possible presence of the demon. Demonic possession requires professional help. Special people called priests, who have dedicated their lives to following the precepts of a Biblical religion, must perform a ritual known as an “exorcism” to drive the demon not only out of their victim, but all the way back to Hell. In 1928 in Earling, Iowa, in the United States, an unnamed 40-year-old woman started to show signs of demonic possession... she was unable to pray, and foamed at the mouth when prayers were said for her. Father Theophilus Riesinger was chosen to perform the exorcism for her, and he prayed over her for twenty-eight days. During this time the woman stuck to walls above the fl oor, vomited impossible amounts of foul-smelling fluids and solids, floated in the air, spoke in multiple voices, and showed signs of superhuman strength... but nothing distracted Riesinger from his prayers. Finally, the demons announced that they were leaving, and shortly after the woman was able to utter her first prayer in years. On rare occasions, the Devil himself will appear on Earth to tempt humans. It’s said that this evil being can give a person anything they desire in life if they promise that their spirit will go to Hell upon death. Many people are tempted by wealth and power, but wise people realize there is nothing that can make their lives better now if the payment is an eternity of punishment in Hell... so selling your soul to the Devil is always a mistake! It’s told that in the year 1740, the Devil appeared in the First Church of Ipswich, Massachusetts, USA. A popular preacher, Reverend Whitefield, was warning people against the Devil and his tricks when the evil one appeared in person, determined to stop the sermon. The Reverend and the Devil began wrestling; the battle took them outside, and all the way up the church’s tall steeple. They struggled to shove one other from the top; the Reverend was the stronger of the two. The Devil spun in his fall and landed on his feet, sending up a plume of sparks and fire; defeated, he ran off, never to be seen in Ipswich again. To this day, the Devil’s footprint is said to be etched in the granite on the ground near the church! Begone Satan!, by Rev. Celestine Kapsner, July 23, 1935. Online: Click Here! The Devil: his Origin, Greatness, and Decadence, by Albert Réville, translated from the French, 1871 Williams and Norgate, London, England. Online: Click Here! "The Devil and Miss Leslie," by Frances de Wolfe Fenwick, story in The Munsey, July 1905, The Frank A. Munsey Company, New York, USA. pg. 497-498. Online: Click Here! The Devil's Footprint, site under Flickr.com, 2010 website. Online: Click Here! Devil's Footprints, Norton, Ipswich, Boudillian, by Daniel V. Boudillian, 2007 website. Online: Click Here! First Church in Ipswich, 2010 website. Online: Click Here! Strangely Enough!, by C.B. Colby, 1959 Sterling Publishing Co., Inc., New York, NY, USA. "Theories About the Devil," article in The Literary World, Vol. XV, No. 392, May 4, 1877, London, England. pg. 276-277. Online: Click Here! "The Wraith of the Winthrop Mansion," by Earnest Bell, article in Appletons' Journal, Vol. XII, No. 297, November 28, 1874, New York, USA. pg. 679. Online: Click Here!